Lincoln is coming along smartly! Thank you. I am getting anxious to see it finished although I know that I still have a lot of sewing still to do. I hadn’t considered that it would look like gingham fabric, but once you said that I can understand why. I enjoy looking through older quilt books to find unusual quilt blocks and this one certainly qualifies. Thank you for your kind comments. Thank you. The Lincoln block is a study in focus and being stubborn. I found the block in Better Homes and Gardens Creative American Quilting Copyright 1989. Their directions are for strip piecing the checkerboards and templates for the other shapes. It was fairly easy to measure the templates and figure out how to rotary cut everything except the diamonds on the LeMoyne Stars. For the diamonds I do use the template. The stars measure 4 3/4″ unfinished. 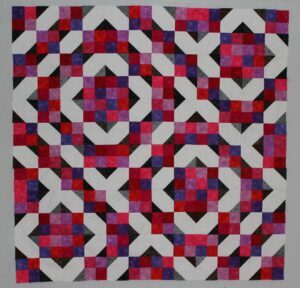 The Lincoln Quilt in the book is a straight set with lots of open space for quilting and uses three fabric colors. 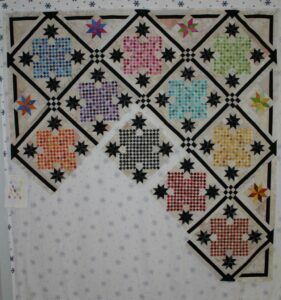 I designed the layout for my Lincoln quilt myself and – as you can see – I am using lots of colors. I am always on the lookout for unusual blocks and this one certainly fits the bill. It takes me anywhere from 2 – 4 days to sew each block, but there is a great sense of accomplishment when each is finished. When you make the Lincoln block I would be very interested in seeing it.